After 8 years of work, 25 000 kilometers of driving and over 10 000 images, photographer Ken Schluchtmann presents his personal journey through the powerful and awe-inspiring Norwegian landscape. 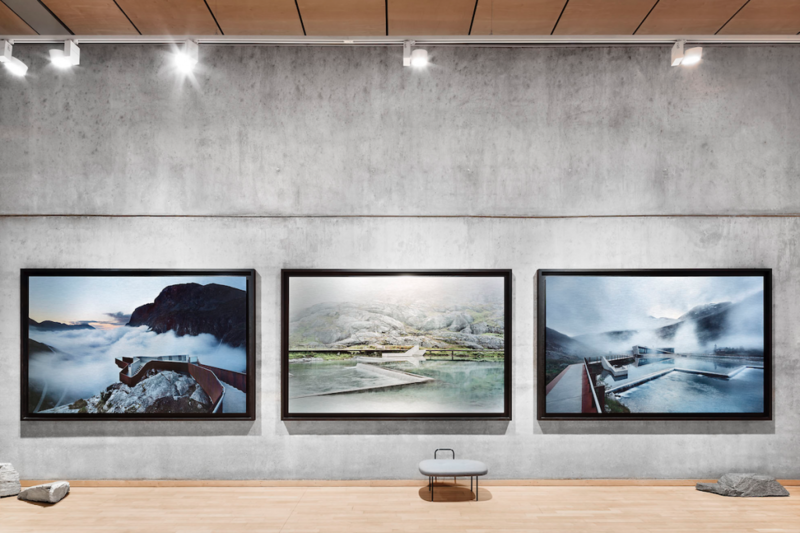 His exhibition Architecture and Landscape in Norway is currently on display at the Felleshus of the Nordic Embassies in Berlin as part of the European Month of Photography. 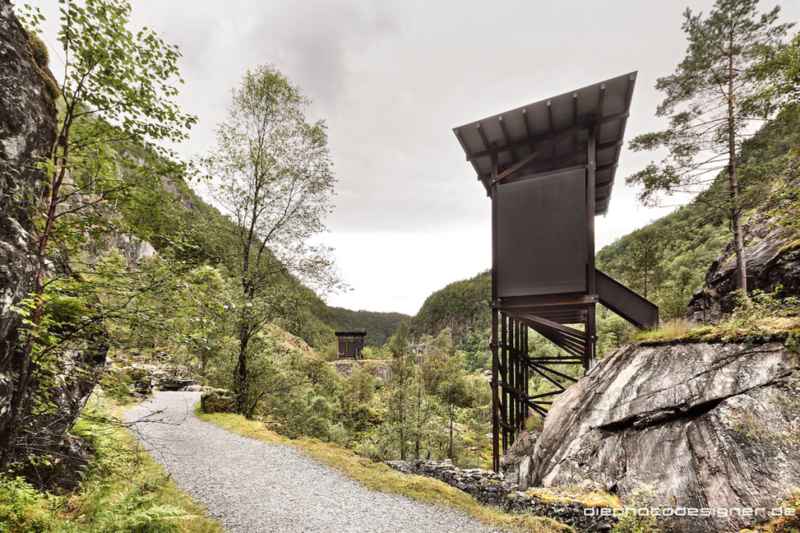 The exhibition captures the unique mixture of contemporary architecture and age-old vistas that are present along the National Scenic Routes (formerly known as the National Tourist Routes) in this Nordic region. 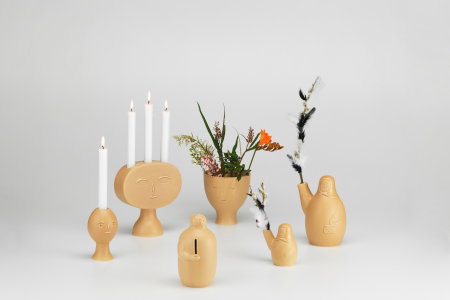 The project began in 1997 when Schluchtmann visited Norway for the first time. Inspired by the natural beauty and architecture he gave up his training as a lawyer and began a more creative career, training as a photographer. 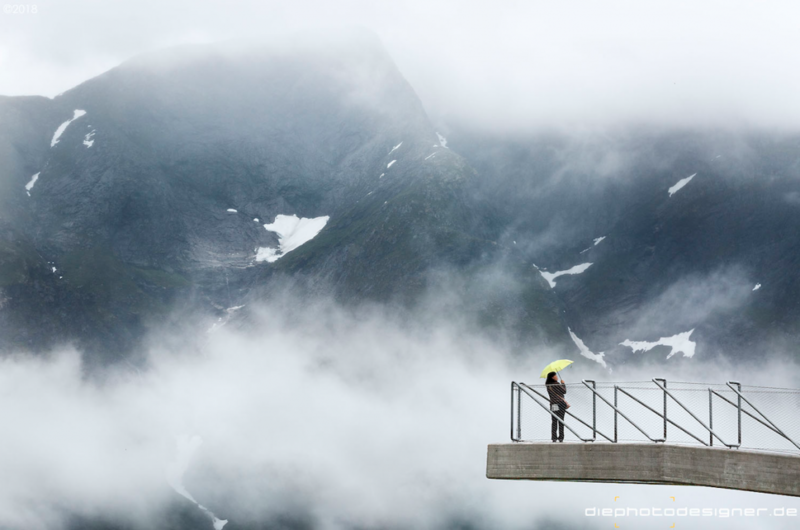 Since then, he has traveled back to Norway 15 times to travel the 18 roads that make up the National Scenic Routes in his VW Camper, capturing the buildings and lookouts that sit nestled among the coasts, fjords, mountain and plains. 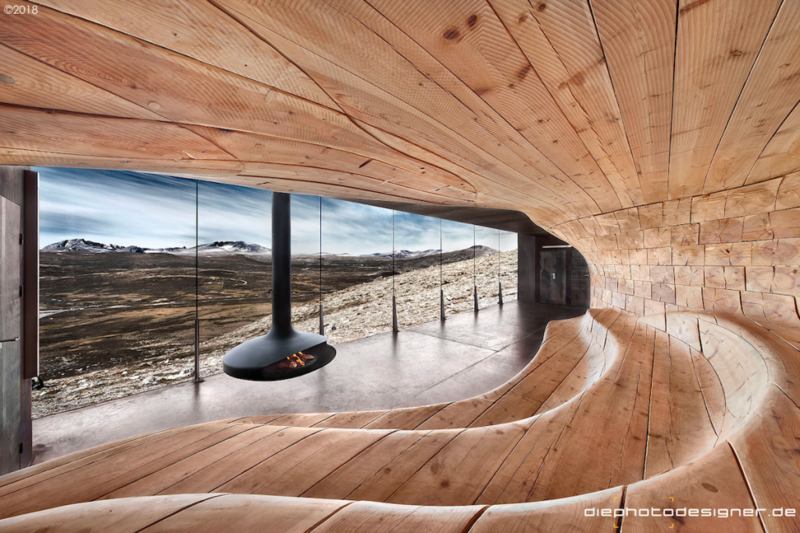 The routes were an initiative that aimed to combine architecture, design and nature to create a unique road-trip experience. Initiated in 1994, the initiative was planned to be completed by 2024 when there will be almost 250 rest areas and viewpoints created by over 60 architectural firms, landscaping firms, designers and artists. Its structures have been created by renowned Norwegian practitioners including Snøhetta, Reiulf Ramstad Arkitekter, Jensen & Skodvin, and Carl-Viggo Hølmebakk as well as some international name such as French-American Louise Bourgeois and Swiss Peter Zumthor. 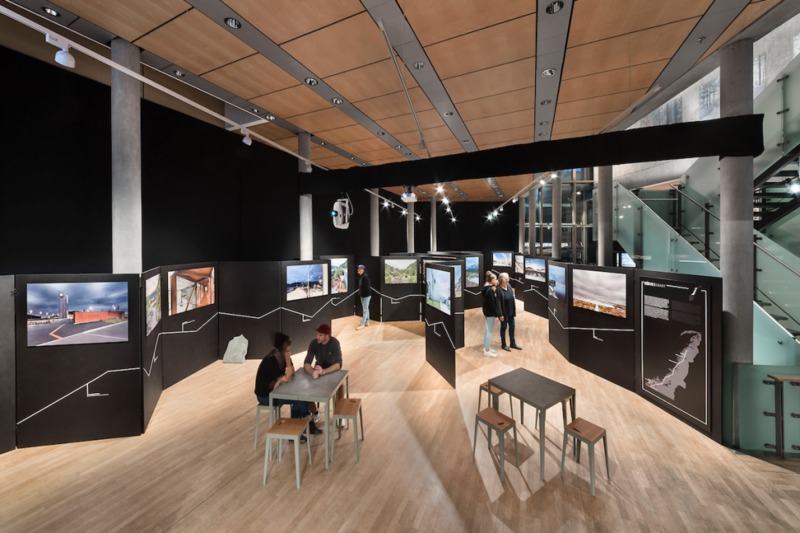 The exhibition was designed specifically for the Felleshus of the Nordic Embassies by Berlin creative agency Bluescope and uses the entirety of the space to show a multimedia exhibition that extends beyond the photographs. Two videos — Making Of and Video Mapping — give the audience insight into the extensive undertaking of the project. They are accompanied by the soundtrack of electronic music that Schluchtmann listened to as he traveled. 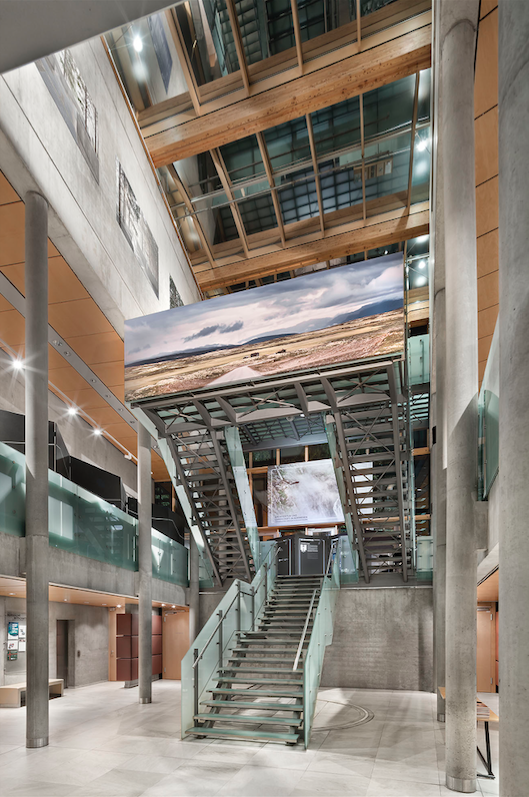 Large rocks collected on the journey and animations also sit alongside the photographs. 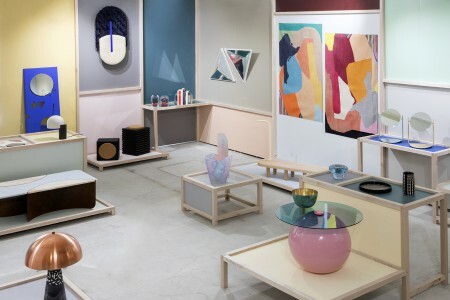 Curated by Janike Kampevold Larsen, an associate professor at the Oslo School of Architecture and Design (AHO) who specializes in the Norwegian landscape and landscape theory, the exhibition is a compelling display of what happens when art, architecture and nature come together. 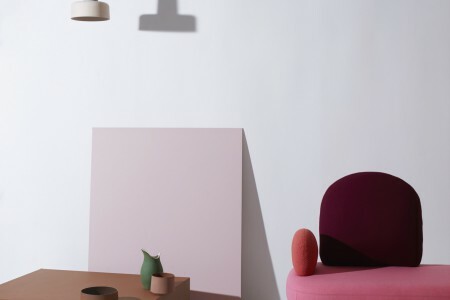 Scandinavian design continues to evolve apace with the design world at large, and Norway in particular has seen a quiet renaissance lately.